These traditional Lebanese zalabia donuts are made with a yeasted dough, spiced with anise and cinnamon and glazed with flower water syrup. Zalabia donuts are made by Christian Lebanese to celebrate the feast of the Epiphany in January, but we love them whenever we want homemade donuts. We also make zalabia with “leftover” dough on baking days and dust them with sugar (find that recipe here). I know, I know. It’s the first week of the new year, and we’re all supposed to be focused on making amends for all of the indulgences we ate and drank during the holiday season and throughout 2017 and every day of our lives until now. And here we are making donuts. But my apology is made with this: Christian Lebanese, from which I descend on both sides, my mother (Maronite) and my father (Melkite), mark the religious feasts of the year with incredibly good food (they’re called “feast days” for a reason!). I especially love the tradition of the Epiphany, a word which derives from the Greek “to show,” and refers to the showing of Jesus to the world (or, biblically, to the three kings). Our people, God love them, somewhere deep in the heart of the birth of tradition, said: how about we celebrate with donuts?! And why not a donut in the shape of a little ball, to symbolize hope and gratitude for coming full circle, and health/prosperity/all good things hoped for in the New Year? And why not glaze that donut with flower water syrup, to gild the lily? So, while everyone puts away the Christmas (I had to hold Dan back from doing it on Christmas Eve…), and gets their healthy on, over here we’re going to do our part in keeping alive our traditions. It isn’t easy, but someone’s got to do it. Consider the dough your palette: flavor it any way you like. In my experience, if you want the children to love these, you better leave the anise out. For the syrup, use a combination of rose water and orange blossom water, or just orange blossom water, for flavoring. In a small heavy saucepan, combine sugar, water and lemon juice and bring to a boil over medium high heat. Reduce heat to low and simmer for 5 minutes. Remove from the heat and add the orange blossom water and rose water (measure away from the pan so spills don't happen in your syrup!). Pour the syrup into a heatproof container and refrigerate to chill completely. 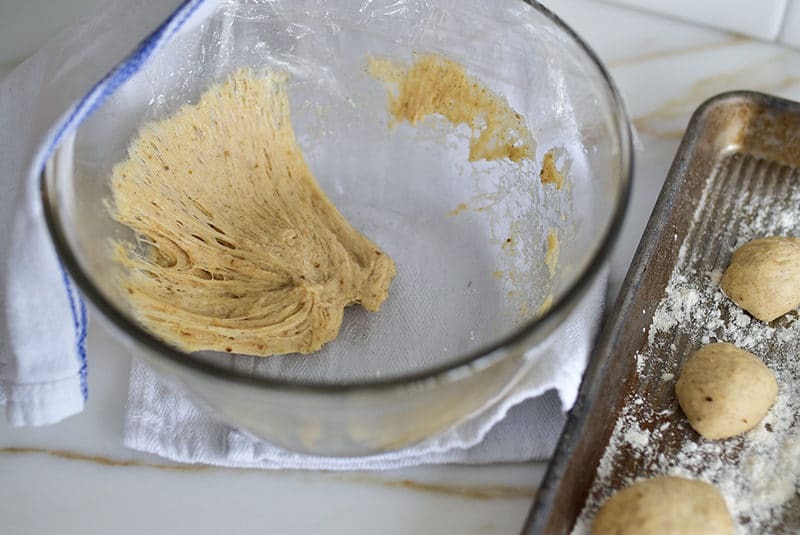 Use a stand mixer fitted with the dough hook, or mix by hand. 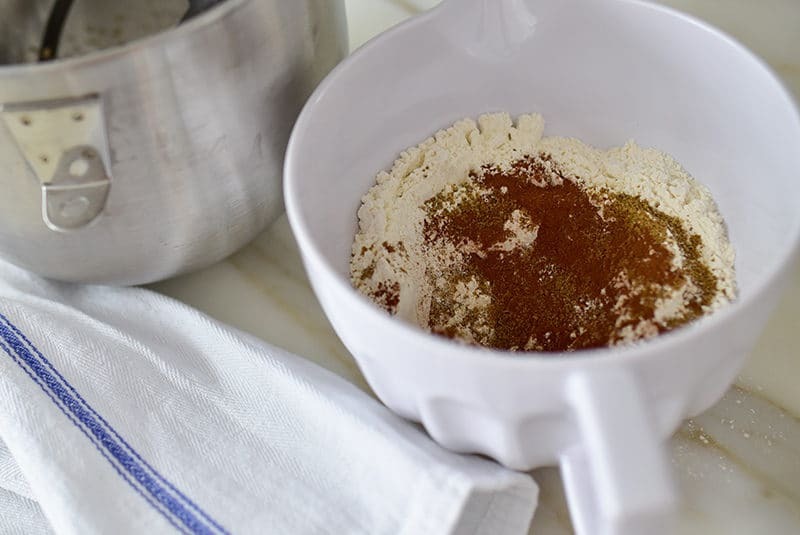 In a small bowl, mix the yeast with 1/4 cup of the warm water and 1 tablespoon of the sugar. Let this stand until it is creamy and a bit bubbly, about 10 minutes. In a large bowl or the bowl of the stand mixer, combine the flour, remaining sugar, salt, anise, and cinnamon. Add the proofed yeast and mix by hand, or with the dough hook on the mixer, slowly adding the remaining water. Knead until the dough is smooth, sticky, and soft. In another medium bowl, coat the interior of the bowl with the teaspoon of oil. Place the dough in the bowl, coating the ball of dough with the oil. 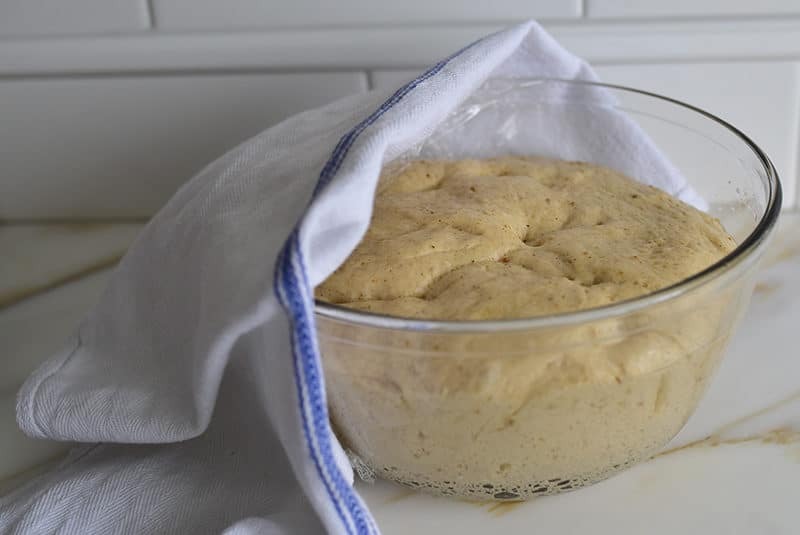 Cover the bowl with plastic wrap (without touching the dough with it), cover that with a kitchen towel, and set aside to rise in a warm spot for 90 minutes. Deflate the risen dough, cover again with the plastic wrap and towel, and let the dough rise again for 30 minutes. Fill a nonstick frying pan to about an inch high with oil. Heat over medium heat to 370 to 375 degrees. 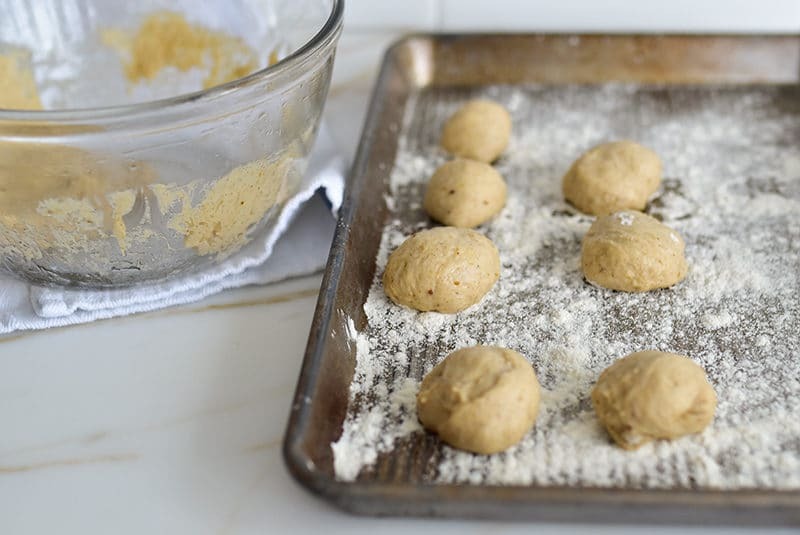 Pull off walnut-sized pieces of dough and shape them into balls. Place the balls on a lightly floured sheet pan. The shape of the balls don't have to be perfect! Set up a rack over a sheet pan next to the frying pan. 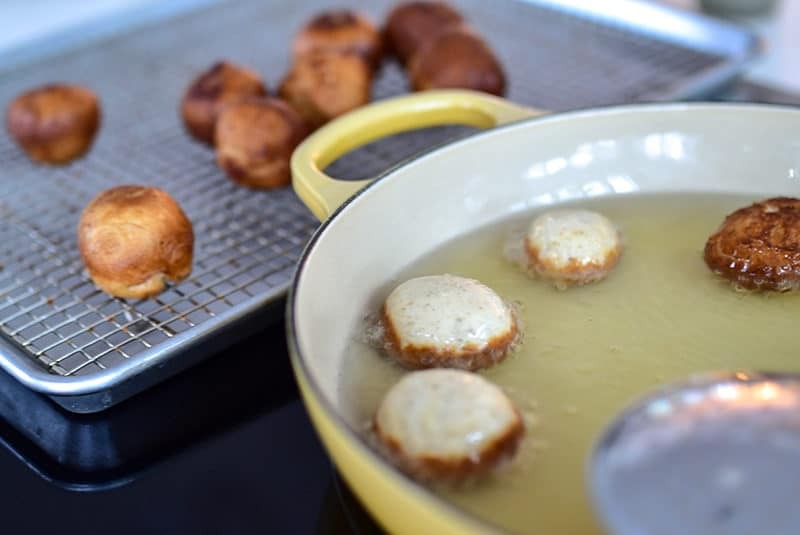 Fry several balls at a time, taking care to cook them through before the exterior is browned by adjusting the heat down as needed. Flip the balls over with a slotted spoon, then remove them when they are golden brown all over and place them on the rack. To glaze the donuts, pour the cold syrup over the warm donuts, or dip the donuts in the syrup. Serve immediately with additional syrup for dipping. 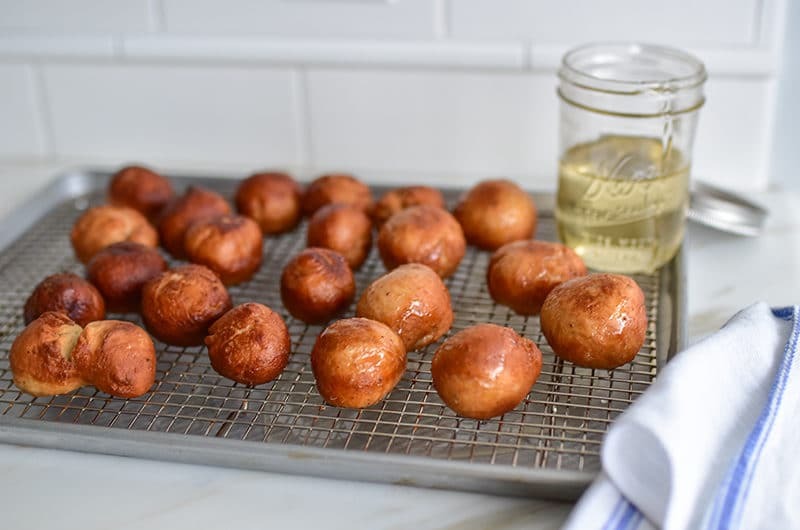 15 Responses to "Zalabia, Glazed Lebanese Donuts"
o, my, maureen, finally some reference to the melkite religion! my mother was maronite, my father, also, melkite. aren’t we the lucky ones to have both influences? Maureen….our Maronite church has Zalabia every Sunday after Mass and the ‘ladies’ of the church rotating who is on the Zalabia Patrol! The only difference from yours is that they make the dough into rings and then fry, add glaze and then with our without powdered sugar. Thanks for brining back such wonderful memories of home. I love it!!! I want to be on Zalabia Patrol! Those are Eastern Rites of the Catholic Church. The Epiphany also marks Christ’s baptism in the Jordan by St. John…thus the donuts that are dunked in syrup. It feels like the last of the 12 days of Christmas. At midnight, on the night before the Epiphany, Maronite tradition has it that Jesus will pass over and bless the homes and that at the moment He passes all creation bows down to Him except for the cursed fig tree and the proud mulberry tree. We greet each other with the term “Deyim Deyim” which means “everlasting everlasting” and signifies that the Everlasting never forgets to visit. On the eve of the Epiphany open all your windows and doors so that Christ can pass over your house at midnight. Stay up till midnight and bow down with the rest of Creation. I’ve been wondering why the syrup should be cold. Does it help it adhere better to the warm zalabia? Thanks so much Michelle! Interesting question–we always pour cold syrup over hot pastry for baklawa, so that the syrup will properly adhere to the pastry. Here, it’s a little different since it’s a yeasted fried dough, and yet cold over hot is always done anyway. The same idea applies I suppose, so that the syrup will sink in more to the donut. We often then dip the donuts again in the syrup while eating…. Hello Maureen. I love reading your posts and trying your recipes. I’m a first generation Lebanese from Australia. I’m Orthodox but my mum is Melkite. 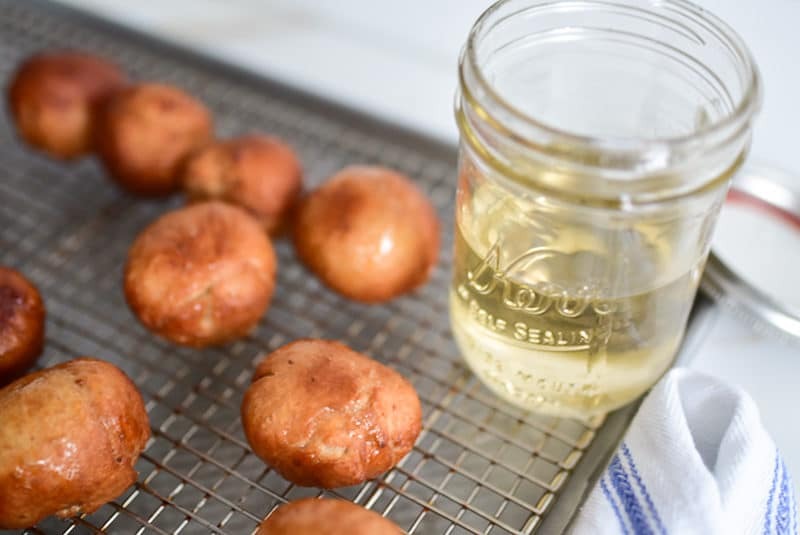 The zlabya and awaymet (balls) being fried in oil and dipped in syrup are representative of Christ’s baptism in the Jordan river which is also celebrated on January 6 as”Eid el-Ghtas” or theophany. Thank you gor sharing this recipe! I had searched everywhere to find this Lebanese version, so I can’t wait to try hours. My mom and grandma rolled them into long strips and twisted them, same thing just a little different. I made your baklava recipe over the holidays and it was so delicious! Your twist version sounds so nice. I’m so glad to hear you enjoyed the baklawa! I just tried some at Beirut Bakery in Redford which were fabulous. I have a feeling that the dough was flavored with Mahlab (sp?) Could that be possible? If so, how much would I use in place of the cinnamon, for example? Hi Barbara–yes, absolutely, you’ll often see mahlab in zalabia. You can sub it for cinnamon or use it in addition to cinnamon, about 1/4 teaspoon.